Born September 20, 1971 in Munich, Germany, Masashi Hamauzu graduated from Tokyo University of the Arts with a vocal music concentration. Raised in a household where both parents were musicians, from a young age he aspired to compose music. As a high school student he began a course of self-study, and following graduation from university he was hired by the music department of game developer Square Enix. 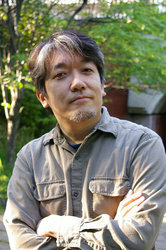 There he contributed original compositions to the titles SaGa Frontier 2, Final Fantasy X, Unlimited SaGa, Sigma Harmonics and Final Fantasy XIII, among others. Since that time a diverse collection of music publications have made use of his knowledge and experience. In 2010 the composer established his own freelance music studio MONOMUSIK and his compositions and arrangements were featured in orchestral concerts outside Japan. In May of 2011, Hamauzu held a solo concert in Paris, France, then took part in "LEGENDS", an orchestral concert of music from games developed by Nintendo, performed by the Royal Stockholm Philharmonic Orchestra in Sweden. He also joined the "Distant Worlds: music from FINAL FANTASY" concert series, making stops in Poland, Houston and Korea. In 2011, the composer established the music group "IMERUAT" with vocalist Mina, whose interest in her Ainu heritage has led her to study traditional forms of instrumentation. In May, the composer attended the "4th Film Music Festival" in Krakow, Poland, where he held his first IMERUAT live concert, followed by performances in Paris, Tokyo and the Hyogo Prefecture. IMERUAT released their self-titled maxi single in May of 2011 and full album "Black Ocean" in March of 2012. The scope of the composer's activities now range from productions organized within the country to events performed overseas.